Used in: North and Central America, Japan, etc. Used in: Europe, with the exception of the UK, Ireland, Cyprus and Malta. Used in: UK, Ireland, Cyprus, Malta, Malaysia, Singapore, Hong Kong, etc. Used in: Australia, China, New Zealand, Papua New Guinea, Argentina, etc. This travel plug charger adapter is not a power converter and does not convert voltage. Please check appropriate device voltage before using this adapter. It is not suited for high-powered electrical appliances. Each country has its own regulations regarding the use of travel adapter, please check in each country before use. 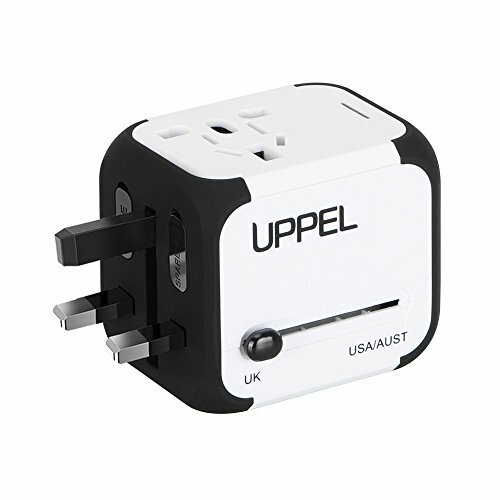 【International Adapter】：The Travel Adapter works all over the world. The Wall Charger covers over 150 countries with US/EU/UK/AUS plugs and Powerful Dual USB Ports. It can be worked in United States, Canada, Europe, UK, China, France, Germany, Spain, Great Britain, Ireland, Africa, Singapore, Japan, Australia, New Zealand, and so on. 【Certified and Safety】: The universal power adapter has FCC, CE and RoHS certified safety system with safety 6.3 Amp fuse ensures complete protection for you.and your devices, Built-in safey shutters protect users from the direct touch of the live parts on the socket outlet. The protection against short circuits, overcurrent and overheating. 【Smart Dual USB Ports】 : The universal Plug Adapter does not need to wait long because it has two USB ports. Applies smartphones, tablet, Digital Cameras and more electric charger. Compact and Powerful World Adapter Plug allows SIMULTANEOUS use of the AC Power Socket and Dual USB Ports and very Easy to use. 【Flexible Adaptation of Modular Structure】: It is all-in-one adapter design. It can be installed in each outlet according to your demand. It is an ideal travel adapter. There is no need to drive around the world to carry several adapters. The Construction is SOLID and STURDY. Compact and lightweight. Optimized to deliver fast, safe and efficient charging. If you have any questions about this product by UPPEL, contact us by completing and submitting the form below. If you are looking for a specif part number, please include it with your message.